This database is a compilation of published and some unpublished isotopic and fission track age determinations in central Colorado. The compiled area extends from the southern Wyoming border to the northern New Mexico border and from approximately the longitude of Denver on the east to Gunnison on the west. Data for the tephrochronology of Pleistocene volcanic ash, carbon-14, Pb-alpha, common-lead, and U-Pb determinations on uranium ore minerals have been excluded. Geochronology database for central Colorado. T.L. Klein, K.V. 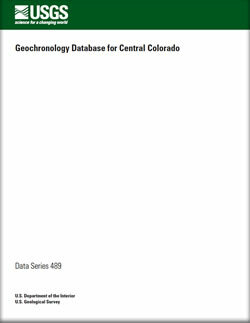 Evans, and E.H. DeWitt, 2009, Geochronology database for central Colorado: U.S. Geological Survey Data Series 489, 13 p.